The creation of dynamic and flexible labour markets increasing flexibility by removing existing rigidities is widely seen as contributing to economic growth. Expectations from flexibility centre on the creation of employment and thus reducing unemployment, increasing the adaptability of enterprises, social inclusion of marginal groups on the labour market (particularly women and young first entrants), and combating undeclared work. Since the acquis communautaire includes instruments on flexible work, Turkey, while preparing itself for accession to the EU, has to take measures to increase flexibility. Moreover, flexibilisation contributes to modernisation of the Turkish labour market, as it has to increase the participation of women in work and it has to reduce the huge informal labour market. protection of flexible workers in social security. In their analysis of the Turkish case the authors explore the role of the Ministry of Labour and Social Security and its affiliated institutions: the Social Security Institution (Sosyal Güvenlik Kurumu) and Is-Kur (which has evolved from the former Public Employment Services Organisation BK); the consistency of the flexibliity clauses of the new Turkish Labour Act with the acquis; and Turkish solutions as compared with those of EU Member States. 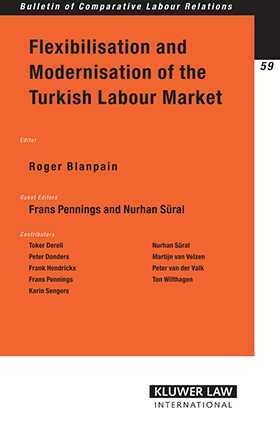 Although it focuses on Turkey and will be of particular interest to practitioners and scholars concerned with EU and Turkish law, the factual and descriptive analysis of labour flexibilisation that the study provides complete with various detailed models of flexibilisation will be of great value in assessing the state of employment law in any country experiencing the economic pressure of the current transitional period in worklife realities. Preface. List of Abbrevations. 1. Introduction; N. Süral, F. Pennings. 2. Flexibilisation and the Formal and Informal Labour Market; T. Dereli, K. Sengers, P. Donders. 3. Institutions of the Labour Market in Turkey; P. Donders, N. Süral, K. Sengers. 4. The Turkish Social Dialogue: Structure, Practice and Attitudes; P. van der Valk, N. Süral. 5. The Implementation of the Flexible Work Provisions in the Labour Act; F. Hendrickx, K. Sengers. 6. The Relationship between Social Security and Flexibility; F. Pennings, N. Süral, K. Sengers. 7. In Search of a Balance: Flexibility and Security Strategies in Employment Protection Legislation, Temporary Work and Part-Time Work; M. van Velzen, T. Wilthagen. 8. Conclusions; N. Süral, F. Pennings. Bibliography. Index.